SPLIT SURFACE DESIGN allows the main table to tilt while the smaller fixed section remains stationary. 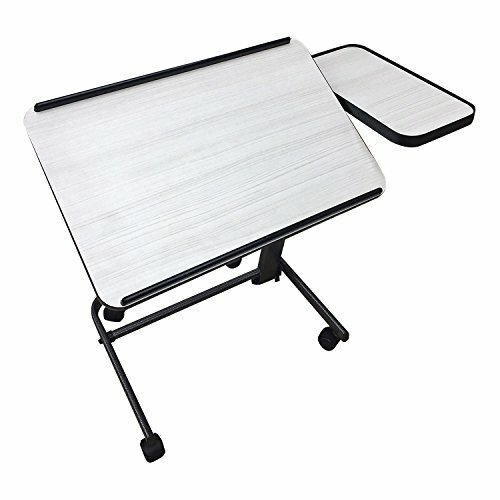 Perfect for reading books or using laptop/tablet on the main surface while the fixed section remains horizontal and usable for accessories like a computer mouse or drinks/food etc. HEIGHT ADJUSTABLE, TILTING MAST AND TWO WAY TILT surface accommodates any type of bed or chair. Industry exclusive U-shaped base combined with a tiltable mast means the Acrobat can accommodate chairs that other overbed tables are simply unable to integrate with due to the table surface distance from the users seated position. CAN BE EASILY STORED AND TRANSPORTED in a small footprint area thanks to its completely vertical table surface adjustment option. Can be stored in a space as little as 5 inches wide. INSTITUTIONAL QUALITY with heavy gauge construction. Table top tilts both ways to allow for use from both sides of the bed. 4 easy-roll casters make the Acrobat easy to move while the two braked casters lock the table in position as required. If you have any questions about this product by Platinum Health, contact us by completing and submitting the form below. If you are looking for a specif part number, please include it with your message.